Most of us remember being told as children to "drink our milk" so that we could "grow big and strong," but did you know that we reach "Peak Bone Mass" between 25 to 30 years of age? Peak Bone Mass is the maximum strength and density our bones can ever reach. Once we reach our peak, bones cannot become stronger or more dense, but we can maintain them. 1. First, our bone cells use proteins and other substances to create a substance known as collagen. 2. Collagen fibers create a kind of "net" that minerals such as calcium, phosphorus, and boron attach themselves. 3. These minerals crystallize to create the "hardness" in our bones. These are called hydroxyapatite crystals. If our diets do not contain adequate levels of calcium (and other minerals) this process cannot take place fully. When fewer minerals are caught in the collagen scaffolding, the crystals created are further apart, smaller and not as strong. The result: weaker bones. Although we can continue to replace lost calcium throughout our lives, it is critical to store enough calcium in our bones while we are young. A 10% increase in peak bone mass while we are young, reduces risk of osteoporosis in our later years by 50%. Even if you are over 30, you should still replace calcium each day by eating calcium rich foods and supplementing. Our calcium needs change throughout our lives. Through periods of growth (such as childhood and adolescence) we need more of this constructive mineral. Calcium intake also will require an increase in our late-twenties/early-thirties. 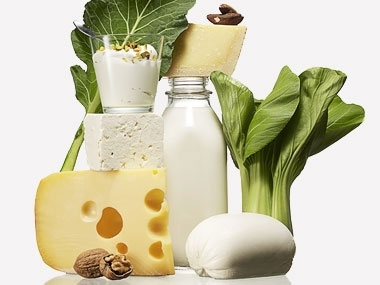 This is the time when calcium absorption can begin to decline and our need to fortify bones and keep density high is paramount to prevent osteoporosis. Osteoporosis is a bone disease that can begin to effect our bones as early as our late 30s, with women (particularly of Caucasian or Asian descent) being the most effected. An uptake in calcium as well as regular exercise can help prevent bone loss and osteoporosis. Bone building exercise must be load bearing and strength building. How can we ensure we take in enough calcium to keep our bones healthy? Unfortunately, most people do not get anywhere near the recommended amount of 1,000mg each day with food alone, and so supplements are an important way to ensure that calcium needs are met. The most absorbable form of calcium supplement is called Calcium Microcrystalline Hydroxyapatite, which we carry in the shop at Align Brooklyn.